In a recent Q&A for Billboard, St. Vincent’s Annie Clark talked about why, despite her recent foray into filmmaking, she’s not all that interested in acting in front of the camera. “I don’t mind the performance aspect of it, because that’s kind of interesting,” she explains. “But I really don’t like the lack of control. I want to direct stuff, because you have control.” The statement shouldn’t be remotely surprising for fans of Clark’s music, even cursory ones. St. Vincent albums thrive on rigor—obsidian-like tones, meticulous arrangements, elliptical lyrical tropes—and thematic structure. Clark creates her own internal logic, ensuring each record inhabits a unique, Narnia-like universe. 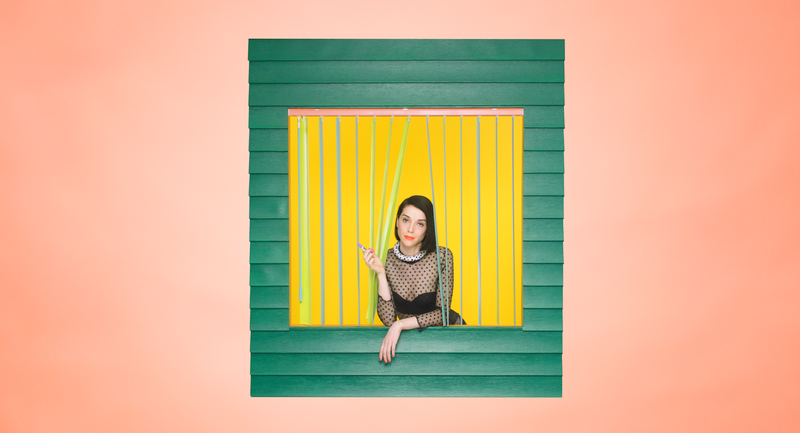 Masseduction is no different; in fact, this latest record is Clark’s best, most cohesive musical statement yet. Lyrically, the record revolves around moments when a façade of control starts to crumble—when anxiety starts to overwhelm (“Fear The Future”); when drugs used to regulate moods become an emotional and physical crutch (“Pills”); when pleasurable things become painful memories (“New York”). There’s a sense of futility to this slippage, as if turning into what you fear (or hate) is inevitable. “I can’t turn off what turns me on,” she intones repeatedly on the Bowie-esque title track, a glossy treatise on fame’s seductive qualities and the catch-22 of online instant gratification. Still, Masseduction leaves plenty of room for equivocation within this fatalism. “I am a lot like you / Boys / I am alone like you / Girls,” she trills on the perforated robo-pop standout “Sugarboy,” a defiant statement on gender and sexual fluidity. And the protagonist of “Slow Disco” realizes that they totally dodged a bullet by leaving an unhealthy relationship early. “Am I thinking what everybody’s thinking? / I’m so glad I came but I can’t wait to leave?” Clark asks, non-rhetorically. Masseduction also smartly acknowledges the emotional complexities involved with moving on, especially when the fissures aren’t tidy. A suicide provokes the deep-seated lyrical longing of “Young Lover,” while the wrenching “Happy Birthday, Johnny” finds Clark conversing with an old friend who “asked me for dough to get something to eat” because he’s fallen on hard times. He lashes out when she hesitates, causing her to contemplate whether his stinging words (“You yelled through your teeth, accused me of acting like all royalty”) are actually true. Clark captures this emotional roller-coaster in her remarkably genre-agnostic music. Although Masseduction contains her familiar hallmarks—bursts of electric guitar, burrowing hooks, intricate execution—the record is futuristic and fractured pop that jumps between frantic new wave, industrial-tinted techno, minimalist balladry, and string-swept epics. Her collaborators aid and abet this approach. The sexualized funk of “Savior” features bass from Pino Palladino (D’Angelo, Nine Inch Nails); “Pills” boasts guest vocals from Jenny Lewis and mournful saxophone from Kamasi Washington; and co-producer Jack Antonoff contributes synths and programming throughout. In other hands, combining these ideas would sound overly busy. However, Masseduction has a fantastical production sheen that gives its music a slightly otherworldly (and, at times, cartoonish) quality. More than that, the record is also a marvel of meticulous sequencing. Songs flow into one another in smart and subtle ways—“Los Ageless” borrows and slows down a rhythmic electro motif from the preceding “Sugarboy,” for example—and Clark wields her voice like another powerful instrument. On the brisk “Pills,” she murmurs, “Pills, pills, pills, every day of a week,” in a no-nonsense tone, as if it hails from a twisted version of Mary Poppins. Her grief-stricken shrieks on “Young Lover” resemble someone in the throes of all-consuming physical agony. Clark recently told Buzzfeed that Masseduction asks, “What does power look like, who wields it, how do they wield it—emotionally, sexually, financially?” Exploring those balances of power gives Masseduction its inherent tension and anxiety. But it also doesn’t let instability win. The final song, “Smoking Section,” talks about going to the edge, nearly giving in to violent and dark tendencies, then deliberately taking a step back. “It’s not the end,” Clark repeats, in a weary and increasingly faded-sounding voice, as ghostly pedal steel smoke rings curl up around her. Defeated as she sounds, it’s an unmistakable declaration of power—an emotional cliffhanger that leaves the door cracked for new beginnings. Masseduction is a manual on how to go through hell and back, then emerge stronger than ever. It’s a record that wrests control from turmoil and believes that a different, better future is possible. It’s the best encapsulation of her vision to date, here fully under her control. Purchasing Masseduction via Amazon helps support The A.V. Club.